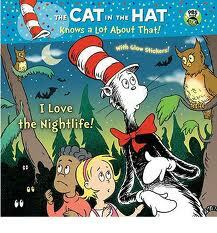 Today's interview is with Tish Rabe, author of I Love the Nightlife which features that oh-so-famous Cat In The Hat. The Nook version of her book hit the number 3 spot in the Barnes & Noble Kids' section on August 18th, and we get to hear all about it! In I Love the Nightlife, the Cat, Nick and Sally travel at night to the forest of Wagamaroo to find the Cat's lost hat and meet lots of nocturnal animals. They try owl goggles to try to see at night like an owl can, they try bat ears to see if they can hear the hat (even bats can't do that!) then try opossum noses to smell the hat (the Cat admits it's one of his oldest hats and it is a bit stinky!) They finally find it and all the animals come to say goodbye. The Cat whisks them home in the Thinga-ma-jigger so they can get some sleep! I wrote my first children's book for Sesame Street in 1985. It was called Bert and the Broken Teapot and was based on something that really happened to me when I was seven and my cat knocked over my mother's antique teapot. Her words to me "I love you more than any teapot" were key to the story and I used them in the book. I have been writing children's books, television scripts and children's songs ever since and to date have written 135 children's books! In 1996 I submitted a rhyming book to Random House which they decided not to publish, but I was given the honor of writing a new line of Cat in the Hat books, The Cat in the Hat's Learning Library and have written 16 titles for this book series. In 2010 a television series based on the books The Cat in the Hat Knows a Lot about That premiered on PBS Kids. Is your book available in printed format? I Love the Nightlife is a "spin-off" book based on a script from the television series and was first produced in printed format complete with glow-in-the-dark stickers! After the success of the show, the editors at Random House decided to make these books available in e-format. Do you believe e-format helps or hurts you as an author? How? I think anything we all can do to keep kids reading and writing is a positive thing. Whether they are holding a book or reading it on an e-reader, the important thing is to promote literacy any way we can. We are competing with so many other activities kids are involved with, if it's easier for them to read in e-format than to carry a book around- I say go for it! The only disadvantage I see is some of these books come with fun "add-ons" , stickers, 3 D glasses, etc. that can't be duplicated in e-readers. Find all the top bestselling e-books for kids and young adults at this weeks' Kids' E-Book Bestseller List. And stop back on Wednesday when we'll hear from Molly McAdams, talking about her e-book success with Taking Chances.